The Florida pompano is a mild fish that's rich in taste with firm, white meat that almost melts in your mouth. All you need to bring out its subtle flavor is a squeeze of lime juice, some olive oil, and a sprinkle of salt and pepper. 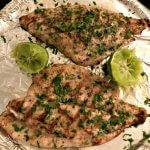 The ideal way to cook the golden pompano is to grill it with the skin on. Rub the fillets with vegetable oil and season with salt and pepper to taste. Grill the fillets skin-side up onver a medium-hot-fire for 3 to 4 minutes. Turn them and cook an additional 2 to 3 minues, until the fish is opaque all the way through. Remove the fillets from the fire and set them on a tray. Drizzle them with olive oil and squeeze a half lime over each. Sprinkle with the Italian parsley. Serve Immediately.